Product prices and availability are accurate as of 2019-04-17 00:22:15 EDT and are subject to change. Any price and availability information displayed on http://www.amazon.com/ at the time of purchase will apply to the purchase of this product. Most drip machines simply drip water over the coffee grounds to make coffee, but coffee needs to be steeped in hot water for full-bodied taste. 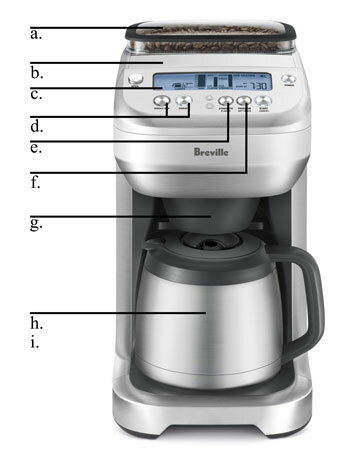 The Breville YouBrew began with the question: how do you brew the perfect cup of coffee from a drip coffee machine? This is how the Breville YouBrew stands apart: it simplifies coffee-making but still makes it possible for you to customize your perfect cup. You’re also not limited to just one cup of coffee; the YouBrew can be used to brew both single-cup servings and multi-cup servings. 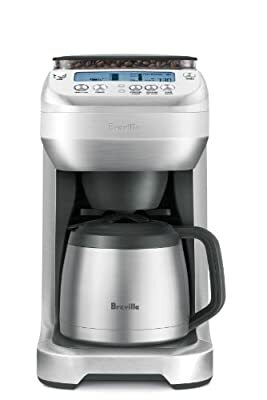 The Breville YouBrew can brew from around 7.5 oz up to 12 cups of coffee, ensuring that you’ll never have more—or less—coffee than you need. 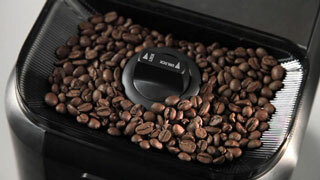 No matter how much water or how many coffee beans you put in the machine, you can adjust the amount of coffee made since the YouBrew measures the volume of water and beans used before making each batch. No more arguments over the last cup, no more wasted coffee. You can brew into a cup, travel mug, or carafe—the YouBrew makes it easy no matter the size. People who love coffee know what they love: whether it’s strong, bold, smooth, or delicate, coffee aficionados have their preferences. How can one coffee machine cater to their needs? 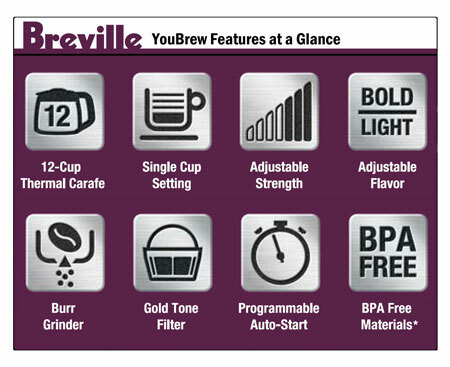 The YouBrew allows you to adjust the strength and flavor profile of your single-cup serving. Seven different strength settings from mild to strong to intense and a choice of five different flavor profiles from light to bold give you more control over how much flavor is extracted from the grounds. Based on your preferences, the YouBrew adjusts the volume of coffee beans ground and the steeping time needed for your perfect cup. Don’t know what you like, or change your mind frequently? With the YouBrew, you can experiment with different strengths and flavors until you find the one that’s just right for you. Save money with the YouBrew: the YouBrew was designed to deliver freshly brewed coffee with none of the added cost (or waste) of coffee pods, so it's friendly to your pocket and the environment. The YouBrew is made from attractive stainless steel, making it not only durable but beautiful. Though taller than the average coffee machine to accommodate the burr grinder, the YouBrew can brew into a variety of cups, including tall travel mugs. 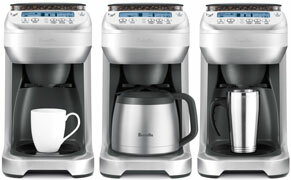 And even with the YouBrew’s numerous options, it is easy to use. The blue back-lit LCD display is intuitive to use, showing size, strength, and flavor preferences in addition to the amount of water left in the reservoir and the time left until brewing is complete. 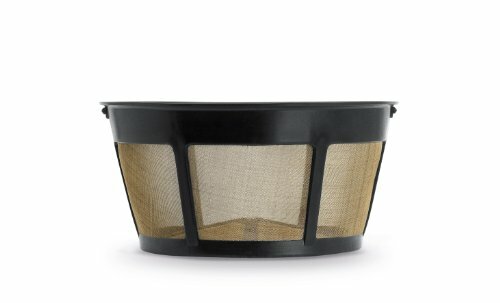 The YouBrew is also easy to clean, reminding you to clean the filter and notifying you when it is necessary to go through the cleaning process of descaling. 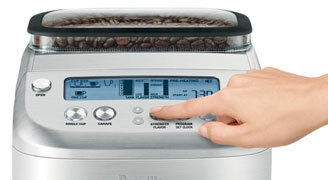 Coffee has never been simpler: enter your favorite settings and a fresh cup of coffee is literally a button push away. You pick the size. When it comes to coffee size, oftentimes it's one size fits none. The YouBrew offers you full flexibility: pick either a carafe (for entertaining) or brew directly into one cup (for one person). The Brew IQ system will intelligently choose the right amount of ground coffee and the right amount of water—at the right temperature—according to your preferences.